Heat oil in large skillet. Sautee onions 3–5 minutes, add garlic, cumin, salt + pepper and stir until garlic starts to soften but being careful not to burn. Add beef and enchilada sauce, stir and cook 7-8 minutes. Spray 13x9-inch glass baking dish with nonstick spray. 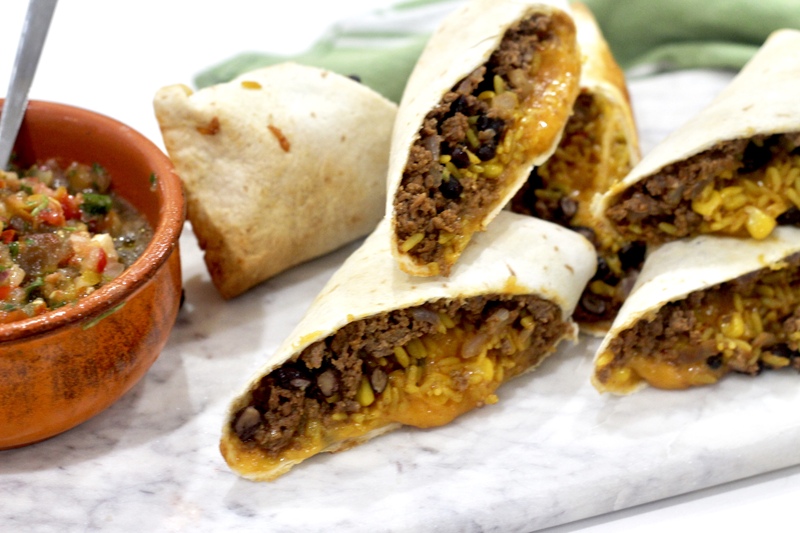 To assemble burritos, spoon beef, beans, rice, corn and cheese onto the center of the tortilla. Roll up tightly and place the filled tortilla seam-side-down in the pan. Continue with remaining tortillas and filling until you have filled all 8 tortillas and have snuggled them alongside of one another in the pan. Serve burritos with sour cream, salsa and avocado.